Music might be in the air on Broadway but Downtown's Ridgefield Spring Stroll (Friday, May 5, and Saturday, May 6) will have plenty of live musical performances and even some family-oriented classes/demonstrations. 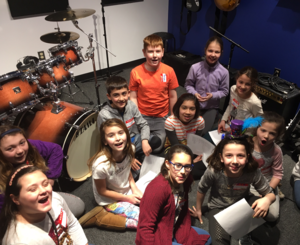 Students and teachers from Ridgefield's-own Bach to Rock will be performing, DJing, and offering classes/demonstrations. On Friday evening, after the fashion show, Bach to Rock DJ student Aiden Scully will be 'spinning' to get us in the mood for jugglers, stilt walkers and magic shows. And if it's the dark that scares you, free fluorescent jewelry will be available to help kids (only) light-up the night!! Rock n Roll for ages birth - 3 yrs. and their caregivers. Rock n Roll is a high-energy and stimulating music and movement class for toddlers and their grown-up. Each class contains a variety of music and movement based activities. Presented by Miss Terry from Bach to Rock. Rock City - Music exploration for ages 2-4 yrs. Rock City offers dynamic musical and movement-based activities, exposure to live instruments and musically inspired stories. Presented by Miss Terry from Bach to Rock. The band Standby featuring Bach to Rock staff will be performing on Saturday afternoon at 4 p.m.
To keep up to date on the fun during this year's Spring Stroll, like Downtown Ridgefield's Facebook page.